“Hospice: The Last Responder” by Ellen J. Windham covers all aspects of caring for someone who has received a terminal diagnosis. The first chapter begins by discussing when there is a diagnosis of terminal illness. It then reviews many other topics including, dealing with family members, stages of grief, funding for hospice care, legal documents, funerals, and more. I found every single chapter to be incredibly valuable and much of the information presented would be helpful for everyone to read, especially the areas on funerals and legal documents. This is information we all need because at some point, we are all terminal. The author does an excellent job presenting the information with a heart-centered approach, making the reader feel like she is talking to them personally. While some of the topics presented might sound a bit dry, such as the chapter on legal documents, it is not conveyed that way at all. I found myself taking notes because, even though I am not currently dealing with hospice, it is incredibly important that we all make sure our own affairs are in order and kept in a way that others will clearly know our wishes. I am also better prepared to know what to do so that if the situation arises that a loved one needs hospice care, and am glad I will have this book to use as a tool to guide me. I prefer learning about what I need to do now because it will lessen my stress if/when that time comes. It is harder to learn something new in a stressful situation. My personal interest in reading this book is based on my goal of serving as a hospice volunteer. I was pleased to gain a global understanding of the hospice industry. I didn’t just learn about caring for the patient, I also learned about how the system is organized so that when I am ready to move forward I will have a better understanding of how everything flows and the roles of the people involved. After reading “Hospice: The Last Responder” I am much more interested in pursuing the role as a volunteer. Rather than scare me off, I know that I will be better prepared when I do start volunteering. I know that I am on the right path. 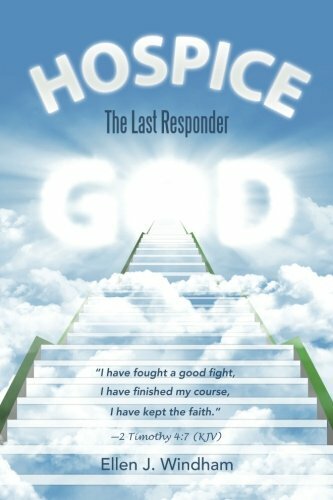 I highly recommend “Hospice: The Last Responder” by Ellen J. Windham to people from every aspect of the hospice industry, including employees, volunteers, care providers and family members.